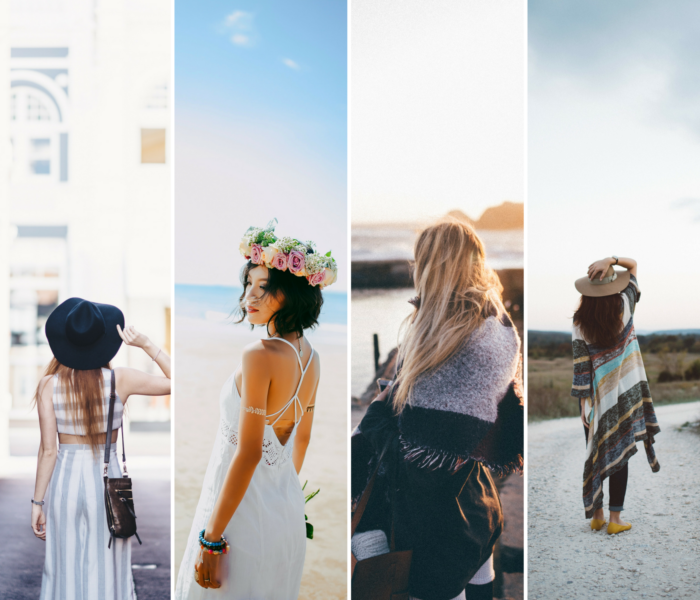 Everyone knows traveling comes with its own set of trials and tribulations. The juxtaposition between storybook moments and major meltdowns is unfortunately just the cost of admission. And while it’s the beautiful blend of highs and lows that make the journey memorable, I believe we could all live with fewer pitfalls of passage. Go with someone you love, whether this is a friend, a spouse, or a family member. Seeing places from more than one person’s perspective can be a very powerful and enriching experience. Always pack some underwear, a toothbrush, toothpaste and maybe some extra clothes in your hand luggage. It’s not funny to arrive in Melbourne on a Tuesday night, wearing flip flops, shorts and a thin sports jacket, in 8 degrees and rain (loads!) with your luggage having been left behind in Singapore. ALWAYS carry peppermint oil on you to INSTANTLY suppress any feelings of nausea. Whether it be a turbulence filled plane ride, a bumpy and curvy bus ride or a fast ride on the high sea all it takes is a dab under the nose or a couple of sniffs. I swear this tip changed travelling for me in the best way possible! Shave your legs with hair conditioner instead of shaving cream –> one less item to pack + you get a super smooth result! 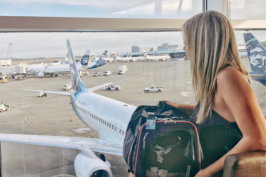 I have picked up endless amount of useful travel tips….. the lifesaving one to make packing easier is to use a compression sack to squish your clothes into a tiny, tiny space! And also that there are some incredibly useful apps out there to make travel easier, like Google Maps and My Maps, Google Translate, XE, Trip Advisor, SkyScanner, Duolingo, most of which can be used offline which is very handy while you’re traveling! Pack clothing all in the same color palette so you can mix and match. If you’re backpacking, bring clothing you would be okay with throwing away. Halfway through my two month backpacking tour, it was simply too heavy and I ditched a bunch of clothes. On that note, arranging destinations from coldest climate -> warmest will let you ditch clothing along the way and make room for souvenirs. Learn basic local language and customs before arriving. Definitely mind your manners and be open to learning about different lifestyles. Have a happy-go-lucky, humility, and play by ear disposition so if and when something goes wrong, it will not ruin your day. Also, take screenshots of maps, save PDFs of train, bus timetables, other maps and useful info on your smartphone for offline retrieval. Dropbox, Evernote, google drive can help with that and syncing your content to multiple devices. Always ask …. an upgrade, a sea view, a table in the garden, an extra ___. Be nice and always ask. All you risk is a no, but quite often you may get a yes. 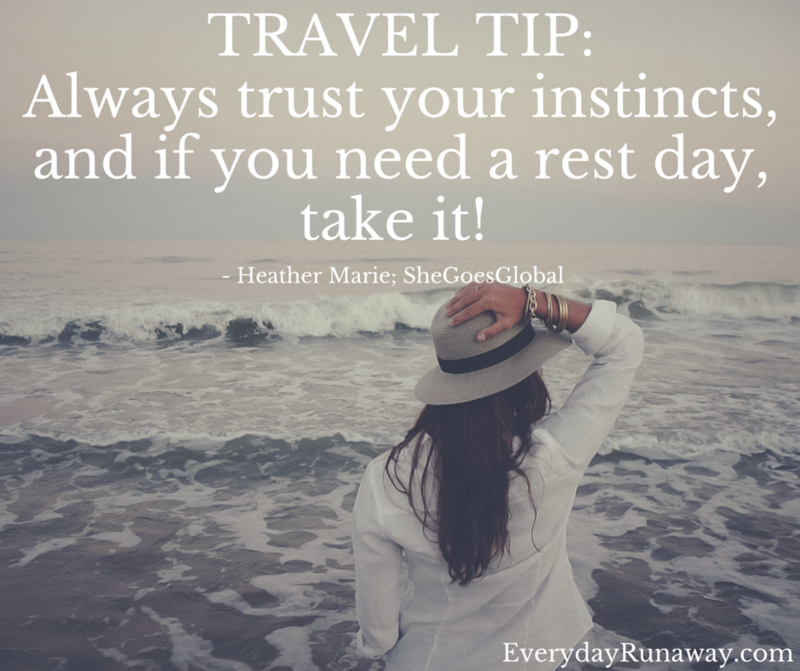 That is my best tip and it doesn’t only apply for traveling. Learn how to speak hello, thank you and goodbye in the local language. Don’t over-plan and leave room for adjustment. Keep one day for doing nothing (it helps you stay sane sometimes) and one day of getting pleasantly lost (it gives you the best surprises). Bring a journal and write it all down. And most of all: stay open. Always trust your instincts. And if you need a rest day, take it! Take a picture of your passport and visa and save it to Evernote. Also, don’t plan way to ahead, visit place A, talk to local in place A and decide where to next. Pack a power strip in your carry-on. You’ll make friends at the airport! 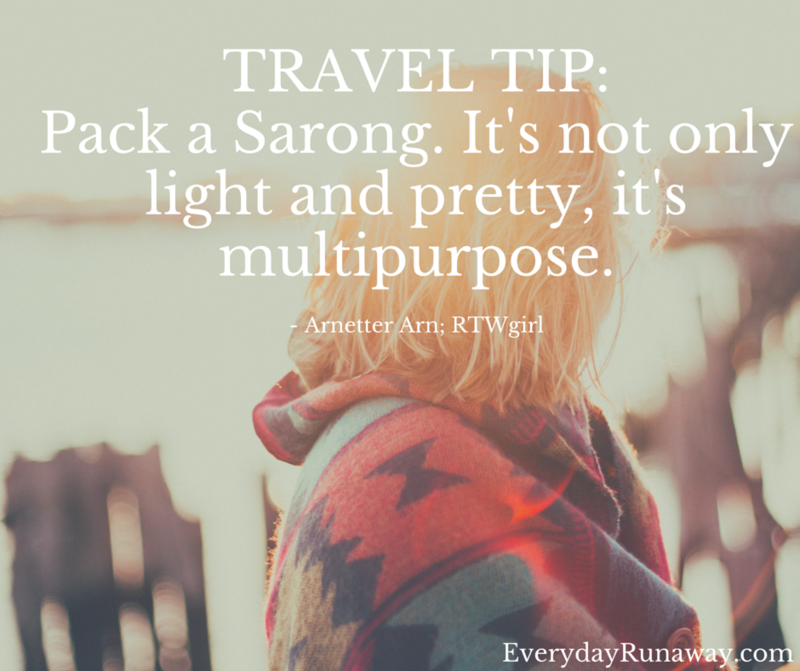 Pack a sarong. Its not only light, pretty, it’s multi purpose. If a non-English country learn to say, hello / thank you / goodbye and your child is beautiful. The last will endear you to half the world. Use a binder clip to wrap and secure headphone wires so they remain untangled when not in use. You can also use a binder clip to cover the head of your shaving razor to prevent accidental nicks. Always keep a positive mindset, no matter what goes wrong or who may not be as kind to you (on a flight, on the street, wherever). 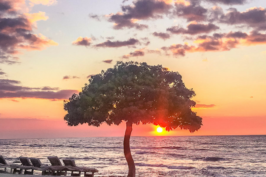 Staying positive truly can make a difference between a bad travel experience and a good one. While not everything is in our control, we can control how we choose to deal with it! Shampoo, Conditioners, Hairdryers, toothbrush, toothpaste, travel iron, soap- don’t carry and save on baggage weight. Hotels give them for free and if they don’t – especially with toiletries, you can buy them from a store at a small price. Pack your clothes in plastic zip-locks- it helps get rid of the excess air and creates space for more clothes/other things. 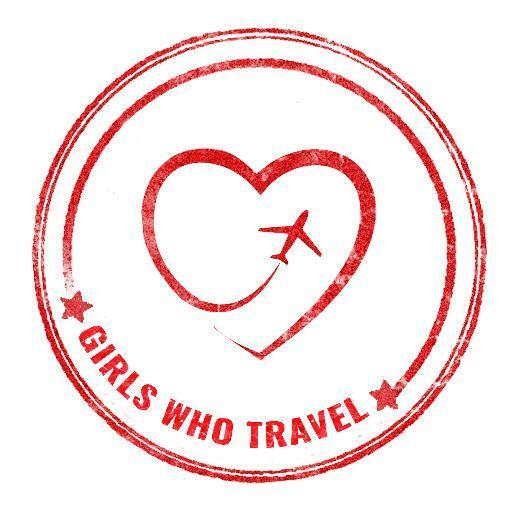 Shout out to the AMAZING ladies of the Girls Who Travel community for sharing their knowledge and travel tips! That is really good advice – thanks I need to keep this list. Happy trails to you!! What a fun list of advice! It’s getting me so excited for my upcoming trip! These are great tips! I always love reading what works for other travelers. Love these tips – I had no idea about the peppermint oil! That’s really good to know because I can be prone to motion sickness. Really great tips! I am going to have to look into the compression sack. I could use that! I always travel with candied ginger or ginger tea for nausea and digestion. Great tips!! I do number 4 whenever I travel! It is so easy, and actually leaves your legs smoother than shaving cream. I had a friend who used to say “always pack a swimsuit and heels.” I take half that advice, and always pack a swimsuit! What wonderful advice! I like the idea of always bringing a swim suit. These are really awesome tips – several of them I’ve never heard before! I so wish I could to more traveling right now but with 2 kids under 2 it’s going to be a little difficult for a while I think. Hoping to make it to Europe in the fall so I’ll have to save this for then! 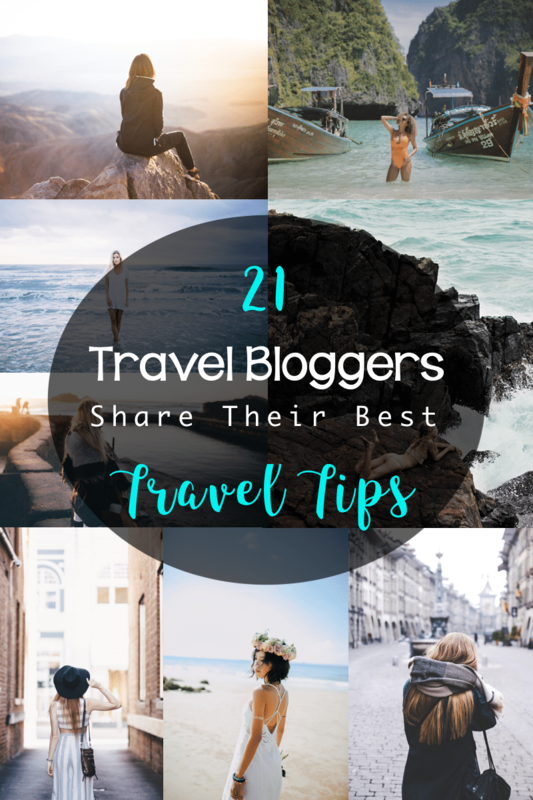 These 21 tips are on point. Thanks for the roundup and intro to a few new blogs. Lots of great tips here! Never knew Peppermint Oil helps with motion sickness — putting that on my shopping list ASAP! Great tips!! I especially loved that one about the peppermint oil as I can get quite car sick sometimes on windy roads. Also, the conditioner trick instead of shaving cream is genius – will definitely remember that for my next trip. Some really useful tips here. Thanks for sharing all. What an amazing list of tips!! Very helpful! I almost want to go pack for my next trip after work!! I love all these comments. Some are so funny but very useful! Keep em up! any attention-grabbing article like yours. It is beautiful value enough for me. Great tips here. Enjoy reading them. I definitely agree with taking photos of your passports and visas! Gotta be safe and have a backup in case they get lost / stolen. Along with that, I’d recommend researching your visas up front before you even book your trip; I think some people just assume they can go anywhere they like. It’d be a shame to be turned away at the gate! All of these tips are amazing, especially the packing ones! Thanks for sharing, I’ll definitely refer back to this post for future travels.